Chanterelle mushrooms (Cantharellus cibarius) are popping up all over the place. It takes a little bit of knowing to identify them. Jack-o-Lanterns are a poisonous lookalike, and so therefore, it also takes a bit of courage to harvest and eat chanterelles. Yesterday I harvested some, and made a delicious garlic-butter saute with them. 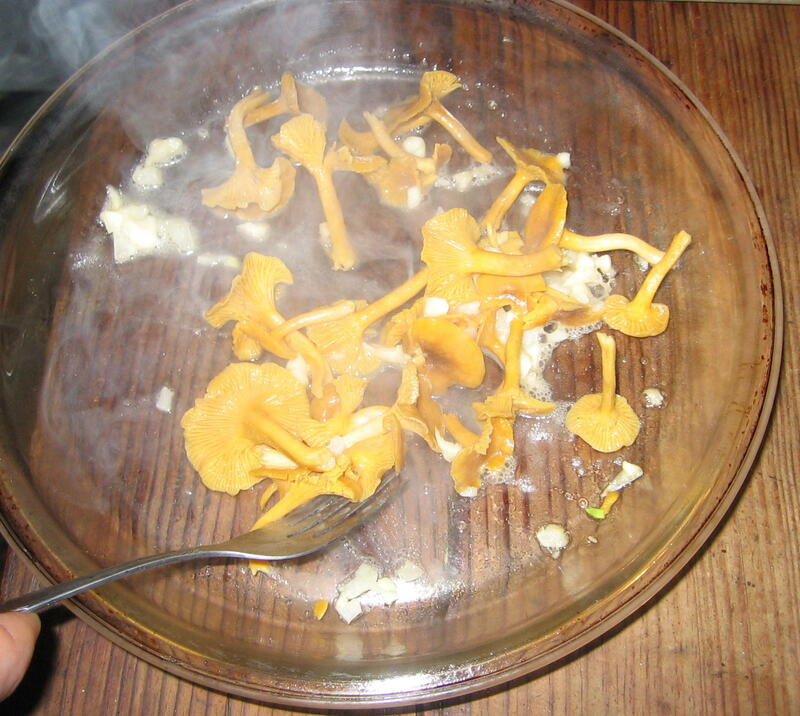 Chanterelle flavor is mild compared to meatier mushrooms like portobellos (Agaricus bisporus) or shitakes (Lintinula edodes). They take on the flavors they are cooked with, which is nice when its garlic and butter. If you’d like to sample chanterelle’s flavor without chancing it, you may want to try the 5 & 10 Restaurant in Athens, GA who has been featuring them on the menu. 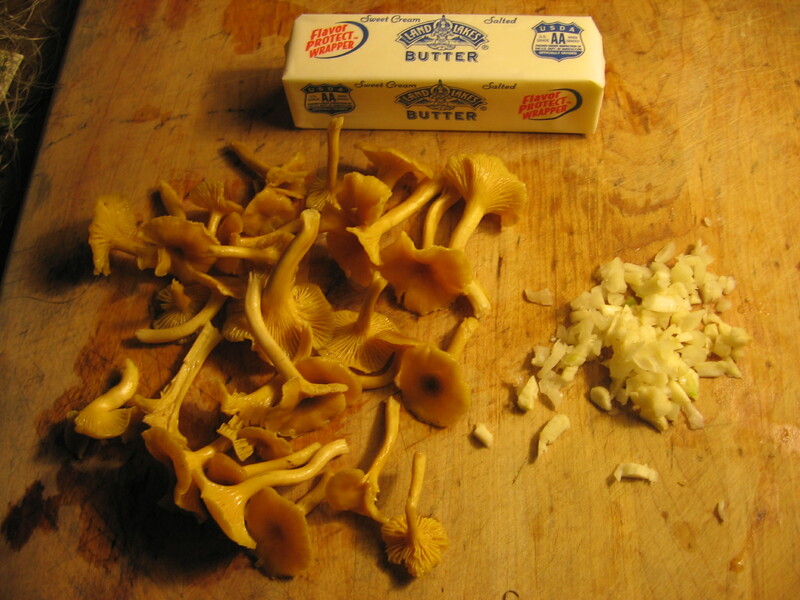 Or, I just saw them for sale at Daily’s Co-op, in which case, you can try your own garlic-butter-chanterelle saute. A quick saute can be done in an oven-safe dish heated in the oven. Take the hot dish out and place on a safe countertop. Melt the butter, add the garlic for a minute, then add the chanterlles. Stir til they look a little melted. I live in Chattanooga, but used to live in Athens, GA. Chaterelles grow in the woods around Athens. I recommend going on a mushroom foraging hike. The State Botanical Garden of Georgia in Athens hosts foraging events, and Smithgall Woods near Dahlonega, GA also hosts mushrooming events. There is a mushroom group in Atlanta, too. My friends in Athens have been finding oodles of chanterelles this year. Good luck. My wife and I recently started hunting for chanterelles after moving to the Chattanooga area a couple months ago from Austin. We have found some on Lookout Mountain, but would appreciate any help with other areas they might be found. 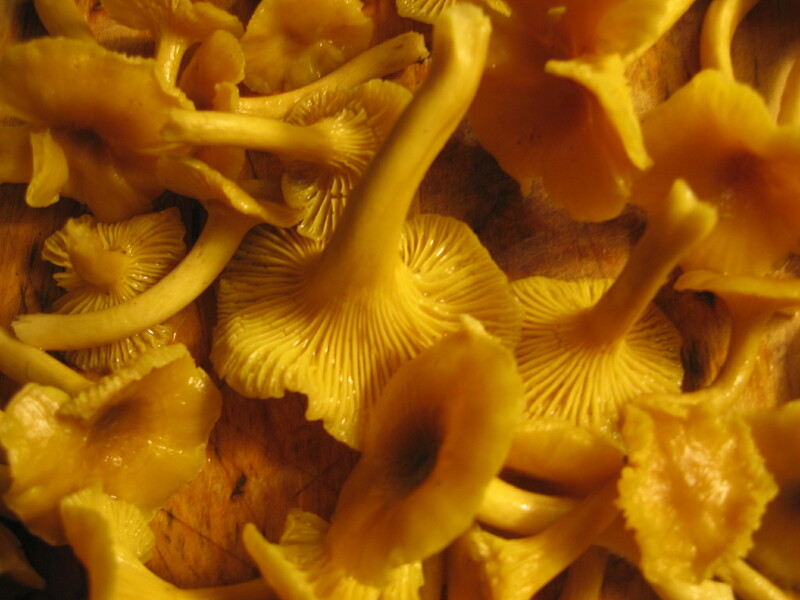 Chanterelles can be found in July and August in forested areas. With such a rainy summer, I’ve found them on nearly every hike on Lookout and in the Cohutta and Little and Big Frog Wilderness Areas. Enjoy, and study your mushrooms guides to discern look-alikes.